Hey guys! I know it’s been awhile since my last beauty review, and I’m glad to say that I’m back on board again after settling down in my new job! Mainly I’ve been posting mini reviews on my Instagram where I’m more active but hopefully I’ll have more time to post more detailed reviews on the blog for you guys after this :) Today’s review will be about a beauty tool that I’ve been seeing everywhere on social media lately. Even my little cousin remarked that he saw this tool on TV when he saw me using it XD It’s the Veet Sensitive Touch Electric Trimmer! Veet has always been known for their hair removal products such as shavers, in-shower shaving creams, waxing tapes, etc. This is their latest product that offers quick & gentle trimming with high precision and no fear of cuts. At first I thought it was an epilator but in actual fact, this is an electric trimmer (note: not a shaver) for use on many delicate areas as stated on the pink & white packaging such as eyebrows, upper lip & chin, sideburns and bikini & underarm areas! From this we can deduce that the tool is more suited to get rid of fine hairs. Now, what’s up with the “No Fear of Cuts” description? It’s because the cutting blades are uniquely designed to remove unwanted hairs, yet do not touch the skin at any point. I was skeptical at first but quickly changed my mind after using the tool. The Veet Sensitive touch comes with a wide range of supplementary accessories such as a two-sided precision trimming head, a one-sided large trimming head, 2 comb attachments, 1 beauty cap, 1 cleaning brush, a plain pouch and an AA battery. Aside from the body, all these accessories are washable and can be cleansed easily by running it under water. This is how the main device looks like. The body has an on-off button at the base part that you twist to activate or deactivate. The device is compact, lightweight and girly which definitely makes it a convenient tool to bring on-the-go. 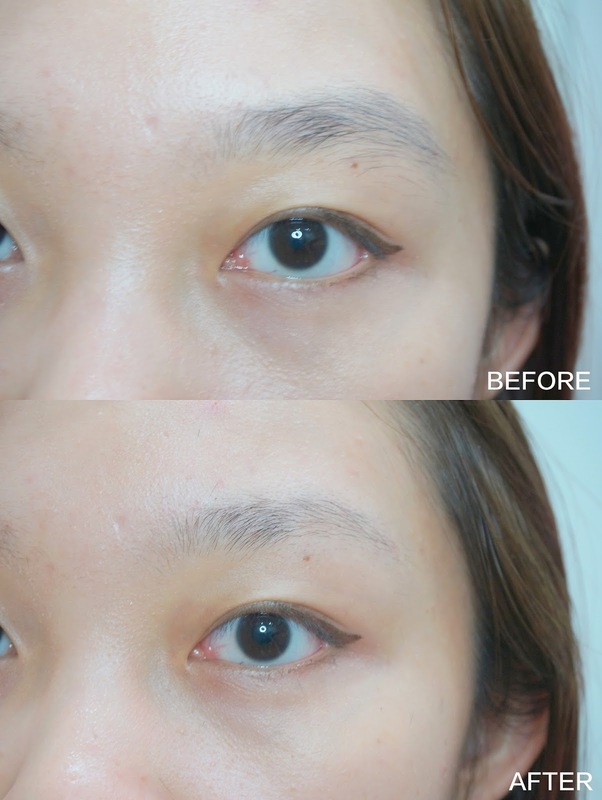 This is the replaceable two-sided trimming head (16mm and 6mm) to trim the brows or chin & upper lip area. This will be the main blade of the device. It comes with a small pink comb attachment that has two lengths (2mm and 4mm) to trim hairs for uniform length. The replaceable one-sided large bikini trimming head (20mm) is mainly used for delicate body parts like underarms and bikini area. It also comes with a larger pink comb attachment for uniform hair length. This pink cap is mainly used to protect the small precision blade when not in use. The cleaning brush is especially useful to brush off excess hair stuck to the fine blades when it comes to cleaning the device. I find it extremely thoughtful that an AA Battery was included in the kit so you do not have to source for additional batteries when first operating the device. To insert the battery, simply twist open the base part and insert the battery. I did some research on how to use the trimmer and I will be demonstrating how to use the Veet Sensitive Touch to trim and shape your brows in 4 easy steps. First of all, you will have to switch on the device by twisting it to the ON button. Hair grows in all lengths so it’s almost never uniform. The trimming process helps to trim down your brow hairs to the same length so that it does not look patchy. With the two-sided small comb, I’ve attached it to the small blade. Gently move the blade away from hair growth direction using the longer 4mm side (if your hair is longer) or the shorter side (for the ends of the brows). Next, use your eyebrow pencil to determine the 3 points that you wish to shape your brows. I’m sure most of you girls are familiar with this concept – the front part of the brows will be parallel to the side of your nose, the arch will be measured from the side of your nose to the highest part of the brow and the tail of the brow will be drawn in an imaginary line parallel to the end of your eye. Using the longer side of the two-headed precision blade, gently move across the brow to get the shape that you wish to achieve. I personally prefer a straighter brow so I used the longer side to remove hair at the tail to give it a shaper end. As for the front part of the brows and also the top part, I used the shorter side of the blade to target finer hairs. Once you’ve achieved the desired shape, it’s time to fill in the brows with your favourite eyebrow pencil or powder! See how the fine hairs has gripped close to the blade, even though there is no sensation during the shaping or trimming process? Final step would be to clean the blade with the mini cleaning brush. Girls, remember to be hygienic and wash the head in between each use, especially if you’re going to be using the same blade for different body parts (like your eyebrows vs bikini area lol). Overall, I find that the device did a pretty good job of shaping the brows but because it is not a shaver, there are still some in-grown fine hairs at the tail (not sure if you can see it in the photo, but it’s visible in real life), so it’s not exactly a clean shave. I usually go to a salon to get my brows threaded but this tool is useful for quick & easy touch-ups, especially for last minute events, when I do not have time to go downtown for threading. I would say that it is indeed gentle and quick to use. Word of caution though: Because the blade is so gentle and does not touch the skin, it is easy to get carried away, which is what I did and accidentally took off a little of the top of my other brow! >< So, don’t move the blade too fast during the shaping process. Another thing to note is that the detachable head and base is not really secure (or maybe it’s just me), as I managed to accidentally twist the head off when it was still running, which can be quite dangerous especially when used near the eyes. I also tried the Veet Sensitive Touch on my underarms using the larger head. I tried it with and without the comb attached and my conclusion is that it is better to use the larger head with a comb as the blades feel much rougher on the skin as compared to the small head. It even left some scratches on my skin without the comb, so definitely use it with the accessory. In conclusion, I am on-the-fence about the Veet Sensitive Touch Electric Trimmer. It does the job well but do not expect it to give you a clean finish as it is a trimmer, not a shaver after all. If only it could be used to remove hair on the arms and legs too, that’ll surely be ideal! Disclaimer: Even though the review was sponsored, it has not affected my opinion in anyway. All opinions on product are purely my own after trying it out personally. The shape is quite nice after that! Like very convenient hor! Yea, rly quite easy to use but gotta be very careful!